We are happy to welcome you to the finals of Creative Business Cup Sweden 2016. Among other things, the program offers live pitching on stage from the five best Swedish creative entrepreneurs, interesting speakers as well as the announcement of the winner. 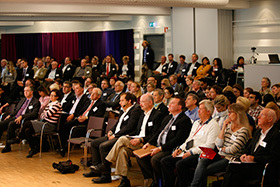 Representatives from the Swedish business industry in Stockholm will be participating as well as local politicians. The winner of the competition will be representing Sweden at the Creative Business Cup International Finals in Copenhagen, November 20-21. Aktiviteten arrangeras av Creative Business Cup.